If you have seen Fear and Loathing in Las Vegas as many times as I have, it's obvious why I would like Ralph Steadman's artwork. On my wishlist on Amazon.com, I have a few of Hunter S. Thompson's books and if his works are as powerful as the bits and pieces you get from the movies I've seen involving him, I'm in for a treat. It's not how people typically move (from movies to books), but it really doesn't matter. 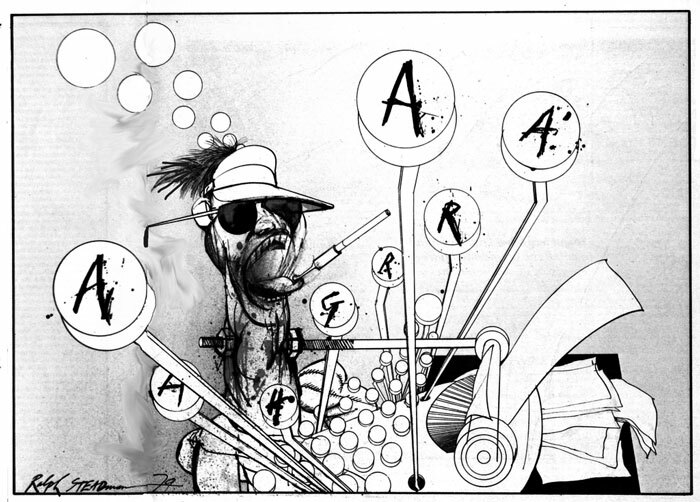 Ralph Steadman was lucky enough to be assigned to accompany Hunter Thompson on several editorial assignments and he developed the Gonzo character in visual form. As an editorial artist, he was able to really push the boundaries with his illustrations.